Deb's Cup of Tea: Not On My Watch! 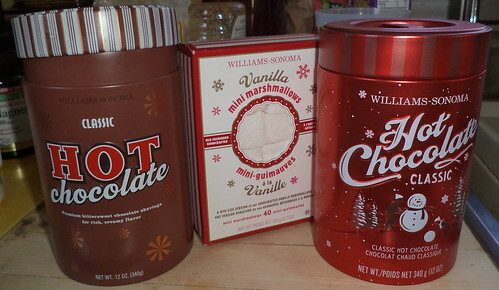 For my birthday, my best friend, Patt, sent me packets of the best instant hot cocoa on the planet. Seriously. 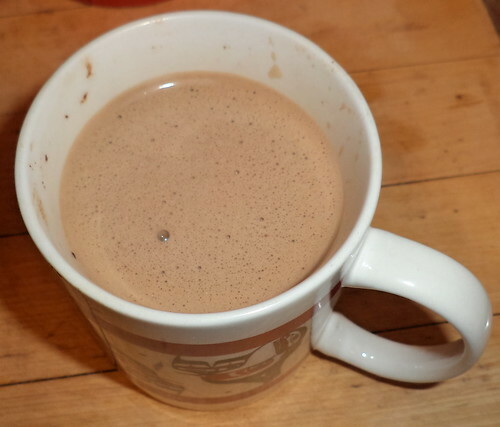 This cocoa is incredibly good. Years and years and years ago (it seems, and then, didn't she just graduate? Time is fluid. ), when Carole was in marching band in high school, to raise money, the band did Market Day fundraising. They bought food wholesale and you purchased this food in bulk. We used to get a lot of meat through them because things like chicken breasts and hamburger patties were individually sealed. 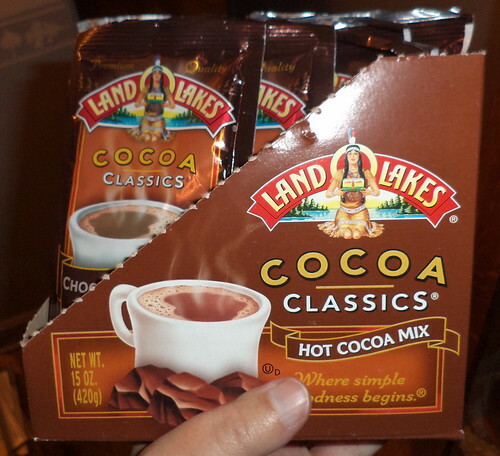 One of the things they sold, from November through March, was a box of Land O'Lakes hot cocoa. There were 6 different flavors in a box. Oh my! We would wind up buying 2 boxes per month and storing them because cold winter months require good hot cocoa to survive. I'm torn about which flavor was my favorite. This chocolate cinnamon was right up there along with their white cocoa and chocolate raspberry. Patt's cocoa didn't last very long. Fast forward to Christmas and there are three packages of the same size in the box of Christmas gifts sent from Carole and Larry. I opened one and knew exactly what the other two would be. Look at this! These are store display boxes of cocoa. You tear off the one side and the cocoa is easy access. There are a dozen packages in each box. That's 36 packages of cocoa. 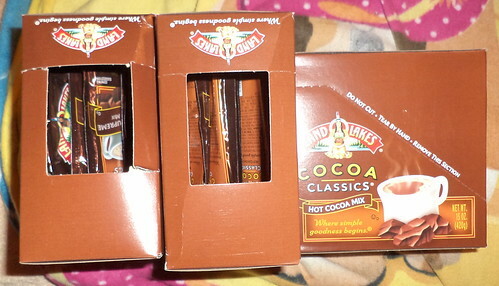 I was sort of parceling them out because I didn't have any other cocoa, not even the mix in milk kind. 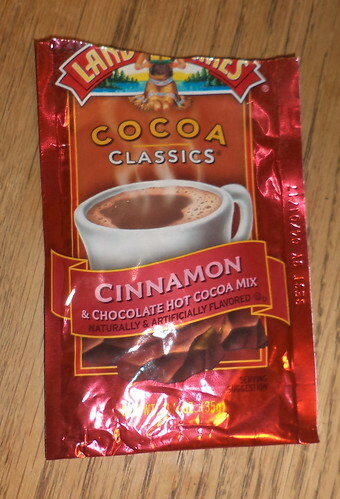 I figured, the next trip to the grocery, I could get the Stephen's instant cocoa they have, assuming they had it. I've gone multiple trips without seeing it. I mentioned to my friend, Terry, that I was low on cocoa. Christmas 2014, she sent me some Williams-Sonoma mix in milk cocoa and I've been working through that. The container was down to a half a mug's worth of chocolate. It's shaved and it actually goes very nicely on ice cream. The first week of January, I get a box. Inside is a note. "I read in your letter that you were nearly out of cocoa. That is not happening on my watch!" The old container is to the left. In the middle are vanilla-tinged marshmallows. They are nice, but I tend to drink my cocoa without adornment. I do, however, add more than the "recommended" amount of cocoa to a mug. It can sometimes be akin to drinking the syrup out of a can of Hershey's, for those of you who remember that. Winter is saved. I just need to make this last until...oh...May, perhaps. The thing about Terry's cocoa is that it has to be mixed in milk. This is a great way to get calcium, at least that's what I tell myself when I'm on my third cup.